First of all, while these two books are part of a larger series, both After Dark and After Glow would be best red together as a set. According to other reviews, the two books detail a complete story arc concerning the same characters and one particular main conflict that spans both books. Secondly, even though I didn't give very high ratings for these two books, I really DID find myself enjoying them. The inclusion of a pet dust bunny as a live animal might have helped out, because despite being described as a predator in his own right ("by the time you see the teeth, it's too late"), I found Fuzz to be immensely adorable and didn't have a hard time picturing a piece of gray fluff with wide, innocent looking blue eyes and six tiny feet. In fact, I have half the mind to go Googling for pictures of possible dust bunny images and making them my mascot. Oh yeah. The rest of the characters and the story were cool, too. Life is tough these days for Lydia Smith, licensed para-archaeologist. Seriously stressed-out from a nasty incident in an alien tomb, she is obliged to work part-time in Shrimpton’s House of Ancient Horrors, a very low-budget museum. She has a plan to get her career back on track, but it isn’t going well. Stuff keeps happening. Take the dead body that she discovered in one of the sarcophagus exhibits. Who needed that? Finding out that her new client, Emmett London, is one of the most dangerous men in the city isn’t helping matters either. And that’s just today’s list of setbacks. Here in the shadows of the Dead City of Old Cadence, things don’t really heat up until After Dark. While I'm always hesitant to dive into extremely long-running series, the Harmony (a.k.a. Ghost Hunter) series seemed interesting enough. For some reason (especially since I have Second Sight on my reading list for this year) I felt some sort of strange motivation to start reading the Harmony series from the beginning while reading the Arcane Society as well. After all, both series intersect at some point and my curiosity as to how this is handled got the better of me. 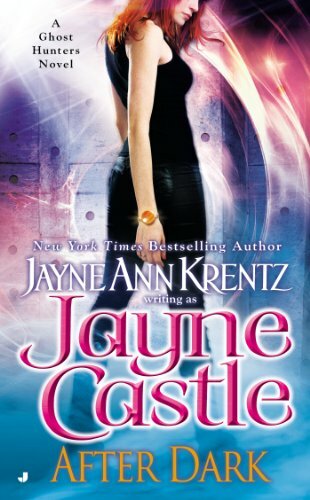 I can't say that I'm entirely in awe of the entire ordeal, but what I've read so far--After Dark, After Glow, as well as the prequel novella Bridal Jitters--were actually quite enjoyable and entertaining. It took a while to understand the workings of the Harmony world, and even then some of the terminology, colloquial dialogue, and references were still a bit confusing. 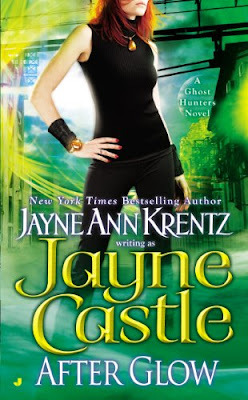 But setting aside the fact that suspension of disbelief must be exercised in force, the world that Jayne Castle creates in Harmony is actually kind of intriguing and quite creative. I think I rather like this series and the world it takes place in. For one thing, I AM kind of happy that there weren't any awkward info dumps, though I DO appreciate seeing some random back history tangents, even if, maybe, they were a bit forced. Nonetheless, I found the prequel novella (see short review here) and the first two books of the Harmony series quite fun to read. Lydia was a delight as the main heroine in a romance: straight-forward, gutsy, sarcastic, and resourceful. There were moments that she became slightly irritating, but those passed by quite quickly and I barely even noticed them. But I truly DID love that she wasn't afraid to be blunt and say whatever was on her mind. Emmett was a typical romance hero, but at the same time I'm happy to say that he was enjoyable as well. He had his moments of broody, alpha, caveman. But he also had enough sense and respect for Lydia to acknowledge when she was the expert and telling her to stay out of situations was pointless or even inadvisable. Together, the two DID make a great team as a tangler-hunter pair. It makes the romance a lot more interesting and likable when the couple can work together and have a nice steamy-hot relationship on the side. The romance itself wasn't the most interesting love story nor was the best I've read, but after two books of the same couple, you grow to love them together a lot. And as a matter of fact, they felt so comfortable and natural together, that I couldn't see the couple in any other way aside from being a pair who've been together forever instead of the short month or so that they'd actually known each other for. While the first book was slightly bland, I think having that second book kind of makes up for it. As an introduction to a futuristic, paranormal romantic suspense, I think this short story arc does it's job nicely. Even if the suspense parts were kind of predictable.